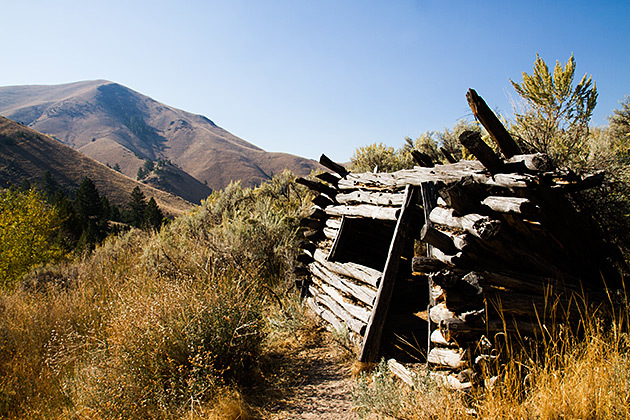 The best hidden gem we uncovered during our travels through Idaho was the Goldbug Hot Springs. 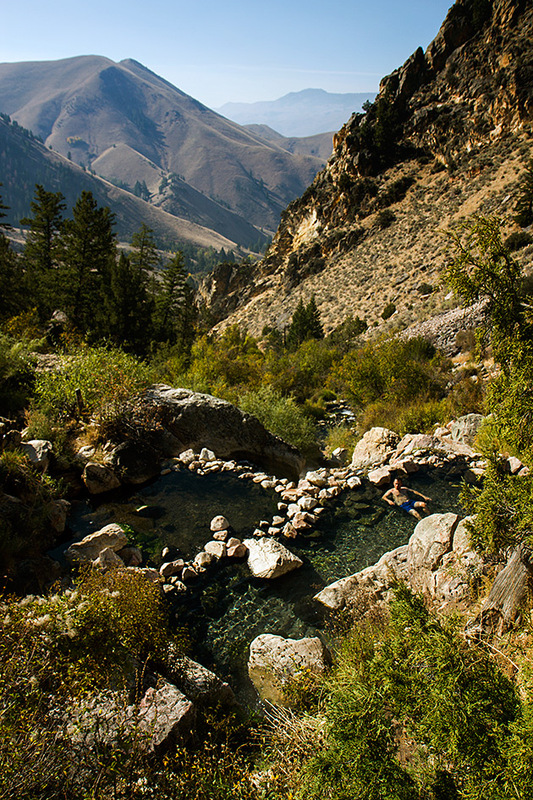 Found at the end of a beautiful and moderately-rough hike through a canyon just south of Salmon, these cascading hot springs offer an idyllic experience, far off the beaten track. We had been completely unaware of Goldbug’s existence until finding a flyer about it in Salmon’s Chamber of Commerce. 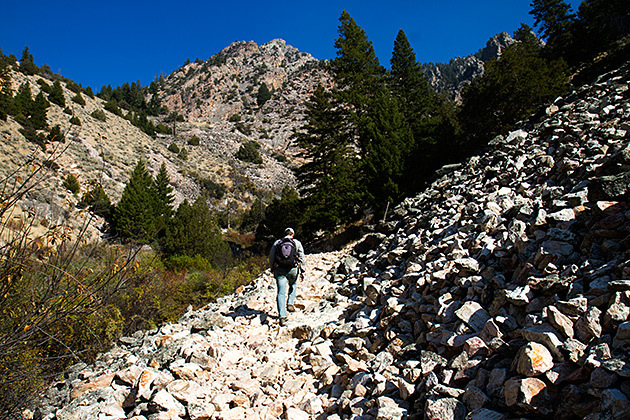 It wasn’t in any of the guide books we read, and even most of the locals we would talk with later, from Challis to Sun Valley, hadn’t heard of it. Or perhaps, they pretended not to have heard of it. Goldbug is a paradise, and there’s no better way to ruin paradise than by attracting too many tourists to it. The trail to the hot springs gets started here in a small parking lot just off Highway 93. 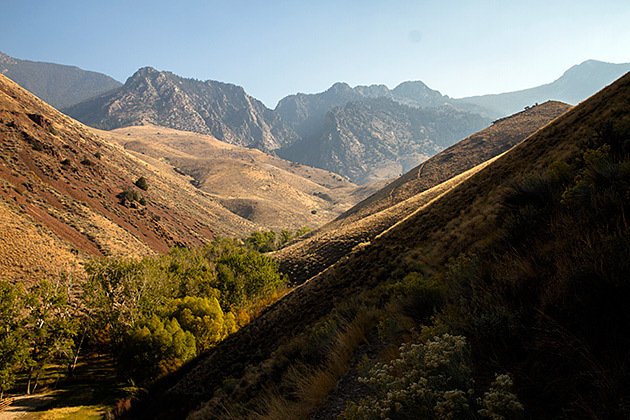 The two-mile trail initially skirts through private property, but soon enters public land and becomes increasingly gorgeous as it follows a small stream into a mountain valley. 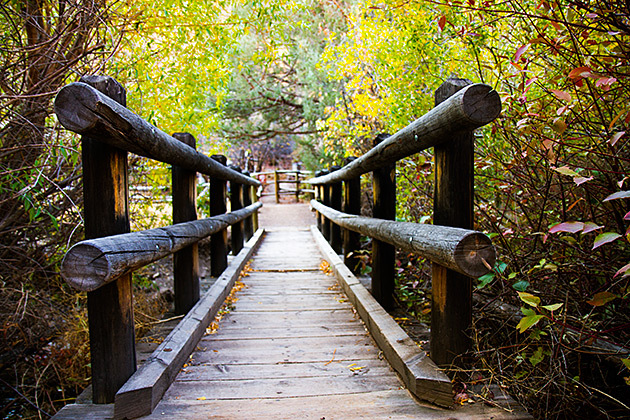 Even without the promise of hot springs, the trail would itself make a great excursion. The final stretch is strenuous, going up into the hills, but the reward waiting at the end makes it all worthwhile. 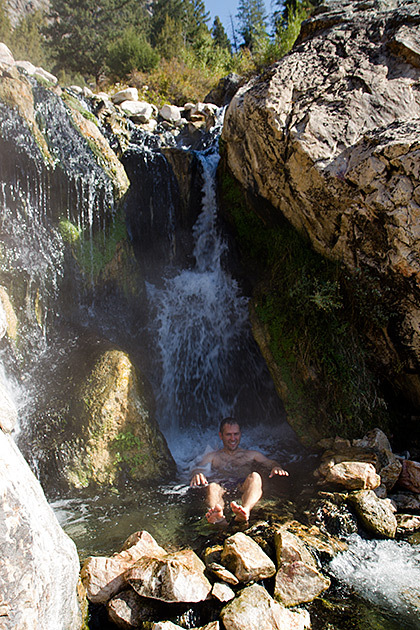 The Goldbug Hot Springs are a collection of five or six pools complete with waterfalls and a view over an unforgettable valley landscape. The pools are of varying temperatures; warmer nearer the source, cooler further down, but never too hot nor too cold. And the waterfalls are the crowining touch; I sat underneath one for about fifteen minutes, just letting the hot water pound my shoulders and neck. 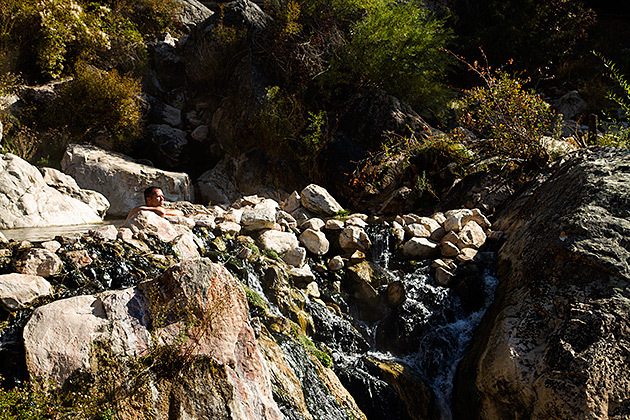 Even if there are other groups visiting the hot springs, the number of pools almost guarantees some solitude. We stayed much longer than we had planned, and felt like we were floating on clouds during the walk back to the car. Apologies to all the residents of Salmon and Challis who would like to keep Goldbug secret. We can totally understand that. But this is a piece of nature so incredible, that it simply must be shared. Goldbug Hot Springs The best hidden gem we uncovered during our travels through Idaho was the Goldbug Hot Springs. 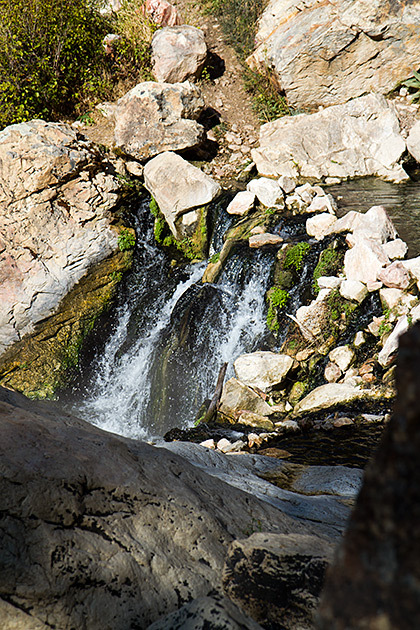 Found at the end of a beautiful and moderately-rough hike through a canyon just south of Salmon, these cascading hot springs offer an idyllic experience, far off the beaten track. I am learning so much about my own state by all of these wonderful blog posts and pictures! Thank you! Thank you for the beautiful write up…I am a weekly “gold Bug” soaker. Recently, My fiance’ and I were soaking and a young couple hopped in with us, but unfortunately, they included their dog. While some people find this perfectly ok, they didn’t bother to ask those who were already in the pool. Although we pointed out that there was several other pools (downstream), they insisted on allowing the dog in the pool. Please help bring awareness to the risks of those actions. If you weren’t aware of any risks, Please visit the link and decide for yourself. I highly recommend all health-minded fellow hot springs lovers to speak out about this disgusting, disrespectful behavior. http://oregonvma.org/care-health/zoonotic-diseases-dogsP.S. I am a dog lover and owner of 3. Ugh, that’s awful! Our most ridiculous hot springs experience was this family who jumped in and starting cleaning themselves with dishwashing liquid! In the hot spring! At least they waited until we were out, but still… !! We were shocked, and it was the last time we went to this particular spring. People are unbelievable sometimes. I have some questions for those of you who visit gold bug frequently. I will be visiting May 31 – June 4th, next week essentially, and was wondering about spring weather conditions. Some have told me that there still might be snow up there. What are usual weather conditions this time of year? Or, if you’ve been up there recently, what is the weather like right now? I’d like to know if I need to be prepared for winter camping or not. 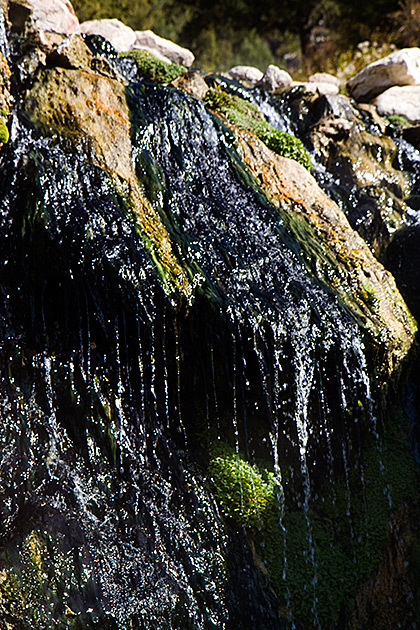 Also, with spring run off from the snow melt, will any of the springs still be hot this time of year? I really appreciate any feedback, as I am flying in from out of state and will need to be prepared! Thanks! I have probably been up to Goldbug as much as anyone. All hours of the day, all days of the week, and months of the year. it was fantastic. I think maybe in the dead of winter it is best of all, but I do advise you to wear ice cleats and be careful it can be dangerous on the trail. If I spend just one night there I sleep right in the pool. When the sun first comes up you will see the most amazing sights. 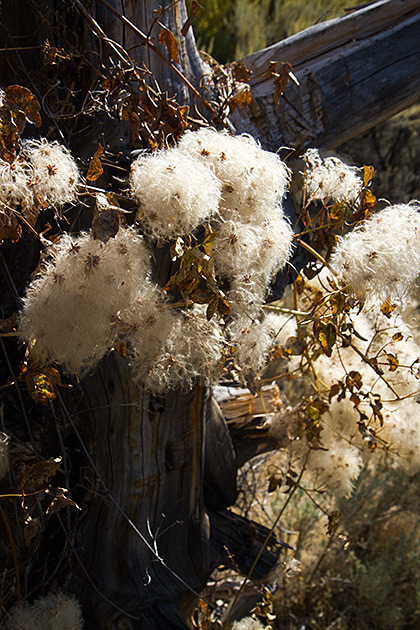 When its cold enough in the shade down on the trail close to the creek you will see twigs with hoarfrost built up; it looks like a feather. One time in the summer I caught a spider on a small rock and set the rock down in some shallow water, the spider walked around the edge of the rock and decided he couldn’t get off so he got on top of the rock, stuck his rear end in the air and turned a real slow circle pretty quick he stopped, rear end still up and stayed there for a bit, then he touched his rear end to the rock and took off across the strand he just built. I told a boy about 12 years old that story and his eyes got as big as saucers I hope I turned him on to science. I am quite sure as spring run off starts all of the pools are to cold to be enjoyed until after the run off. People have made the pools much bigger allowing moss to grow because there is so much more water and deeper allowing the cold water to come in from the bottom. It use to be a person could go up there any time and have a nice soak , but not any more sorry, now only before and after spring run off. 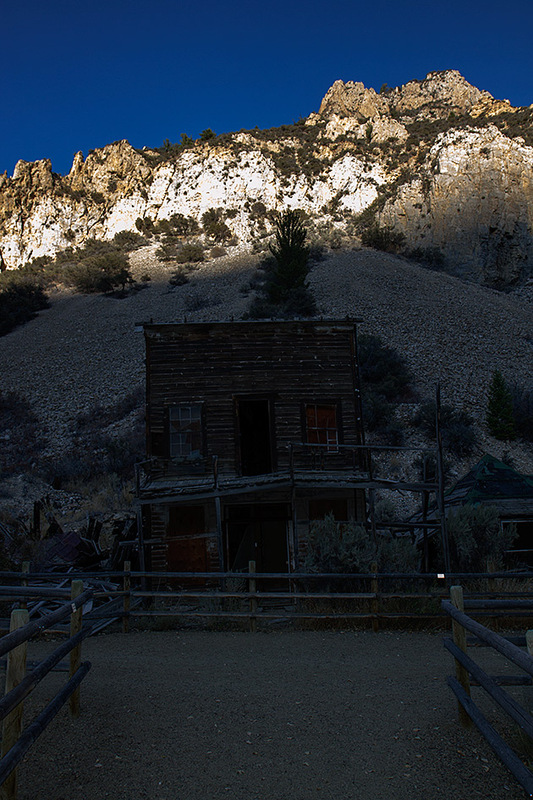 There have been several times I went up there in the morning spent the day went back to town Salmon or Challis ate supper and went back up there that evening, I absolutely loved up there . A lot of skinny dippers go up there me included although I haven’t been able to get up there in about 7 or 8 years. 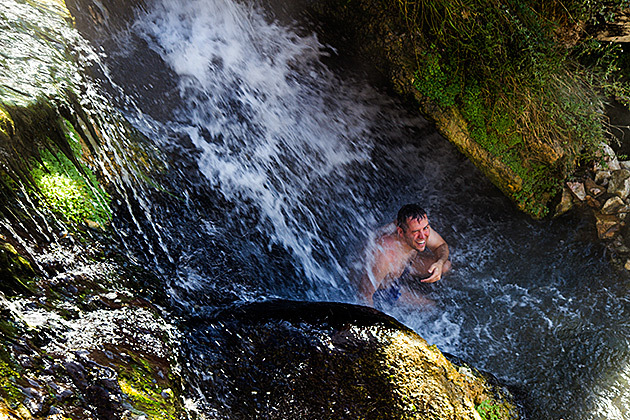 Go on up and have a nice soak its well worth the trip, I have met people from all over the world. Rick,That is exactly what I needed to hear! 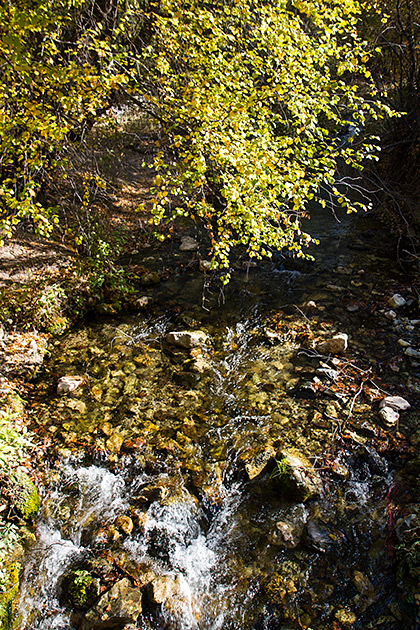 I found goldbug hot springs a while back but it looked ideal to go in fall. 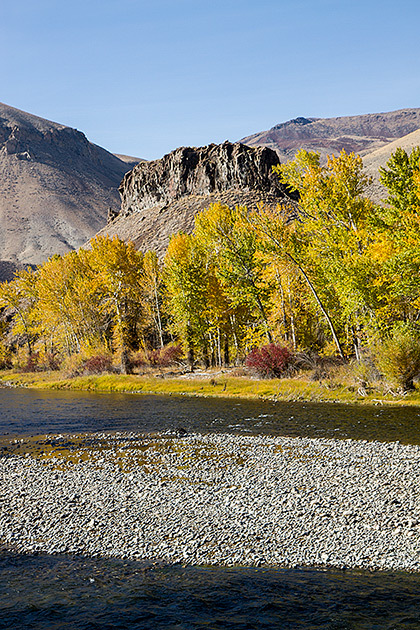 I would love to go sometime this season, and I was curious about camping areas? It’d be for a few nights. 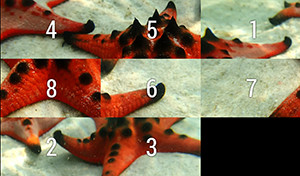 Where is best? 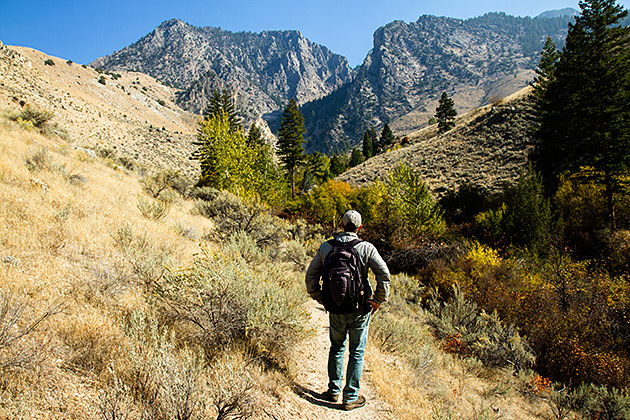 Down below, and then drive to the trailhead? or on the actual trail somewhere, if its legal…? Advice? surrounding landowners and avoid blocking driveways. 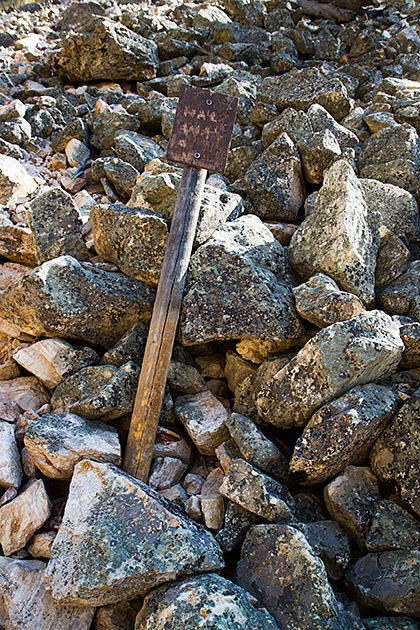 Camping is not permitted at the trailhead.